Griffintown’s most historic and haunted sites come alive during Haunted Montreal’s frightful new ghost walk, “Haunted Griffintown” this Halloween season. The Lachine Canal walkway, where many mysterious deaths have occurred. Photo by Katerina Gang. Haunted Griffintown might best be described as a walking theatrical performance. The tour is led by trained actors and historians Donovan King and Tim Hardman, each of whom plays a character throughout the walk. While the tour delves deep into Griffintown’s folklore, it is deeply rooted in historical events. Every story told has been researched by historians and “contextualized within Montreal’s culture,” said King. Haunted Griffintown tours depart from Griffintown Café on Notre Dame Street Ouest at 8 p.m. when the cold darkness helps set the mood. Mary Gallagher, a prostitute who would hang at this corner, was decapitated. Photo by Katerina Gang. The tour follows Professor Beeblebock (King) and his graduate student, Jacob Bayou (Hardman), as they take you through “Canada’s most notorious shantytown.” The tour’s first stop is a park at the former site of St. Ann’s Church. The park is home to many ghost sightings, including one tale of a vanishing funeral procession. 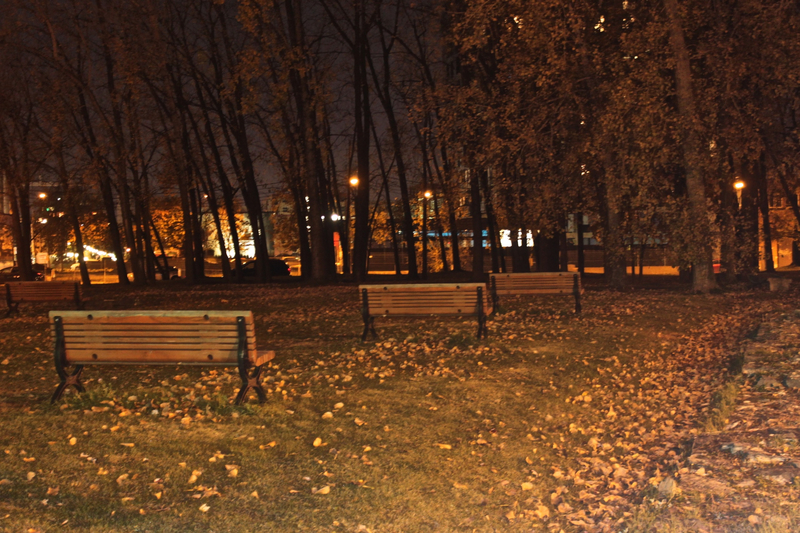 It is hard not to feel a little spooked as you walk under the looming trees, past benches arranged like pews, in total darkness. As the tour winds along the Lachine Canal, King and Hardman treat listeners to stories that masterfully blend history and folklore. The canal has witnessed many disturbing deaths. From typhus-stricken Irish immigrants dying in fever sheds in 1847, to a young boy crushed by a swing bridge in 1908, to a mysterious drowning in the Peel Basin in 2010, the stories told are delightfully horrific. The stories give rise to some captivating paranormal sightings. As King and Hardman share stories of orbs hovering over sites of fever sheds, and of a vanishing young boy walking along the abandoned Wellington tunnel, it is hard not to feel as if someone is watching you. The site of the Liberator Bomber Crash in 1944, now where condominiums lie. Photo by Katerina Gang. The tour ends with Montreal’s most famous ghost story: the murder of prostitute Mary Gallagher. King’s description of her gruesome decapitation and mutilation are enough to keep you up at night. His description of her reappearance on her street corner, however, really makes you lose your head. The site of the former St. Ann’s church in Griffintown. Photo by Katerina Gang. Haunted Griffintown tours are being offered Oct. 29, 30 and 31. Visit http://www.hauntedmontreal.com for tickets.